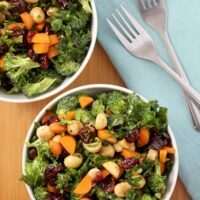 Crunchy Kale Broccoli Salad is a perfect side dish, especially when you load it up with tart cranberries and rich macadamia nuts in sweet balsamic dressing! My kid – Darrol – and I whipped up this kale broccoli salad when we had company coming for supper. I’ve found that he’s much more enthusiastic about eating veggies if he helps with the prep, and massaged salads like this are perfect for making with kids. Y’all, this salad was basically all Darrol’s idea. He has been really into balsamic vinegar lately, and it was actually his suggestion that we make this a kale broccoli salad mix. The original plan was just to make a kale salad. What we got instead was this epic bowl of magic. 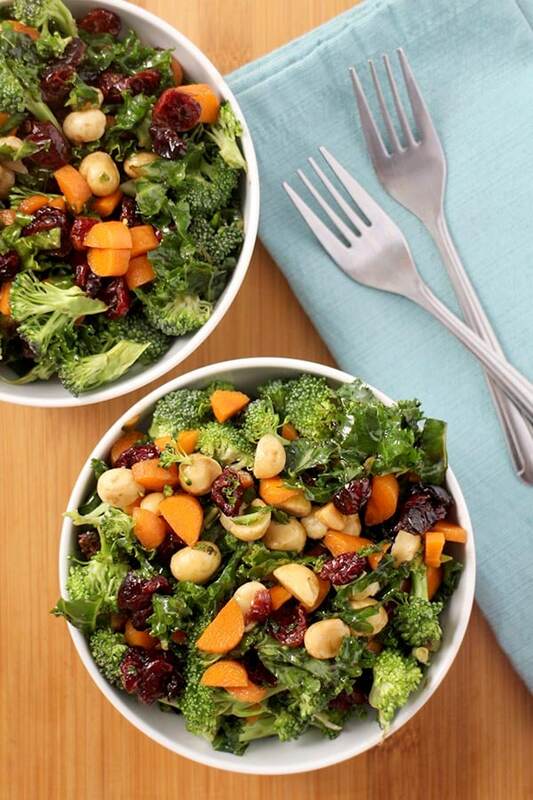 Massaged kale is the base for this salad recipe. With clean hands, just rub down that kale with balsamic vinegar, olive oil, and sea salt to get started. Your kid can totally do that first step with minimal supervision. Just supervise their pre-massage hand-washing. We have a “Three Happy Birthdays” rule for massaging kale – you have to scrub your hands with soap while you sing happy birthday three times at the normal tempo. From there, I let Darrol choose all of the mix-ins. He loved pulling the broccoli into teeny pieces while I chopped the carrots. Then he raided the pantry for cranberries and macadamia nuts to toss in. What’s great about this salad is that you can prepare it up to a day ahead of time. The macadamia nuts, broccoli, and carrots will soften a bit overnight, as they absorb more of the delicious balsamic dressing. It’s a healthy, crunchy bowl of goodness that you can serve immediately or the next day. We served this up with Air Fryer Tofu and my Baked Macaroni and Cheese, but really, you can dish this up anywhere you’d serve a green salad. I used the leftovers the next day as the base for a bowl lunch, topped with chickenless tenders and a healthy squeeze of sriracha sauce. 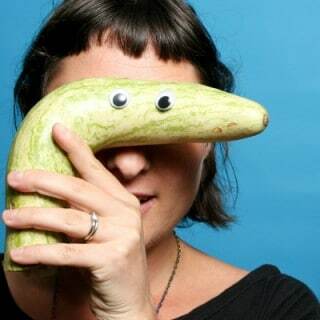 You can use this for other bowl situations, too! Baked tofu or cooked chickpeas would both be lovely ways to turn this side dish into a proper meal. It also makes a nice substitute for slaw at your next cookout. If grain bowls are your thing, this salad is a perfect mix-in. Just serve yourself up a double portion of broccoli salad, and toss it with some quinoa or other whole grain to bulk it up a bit. 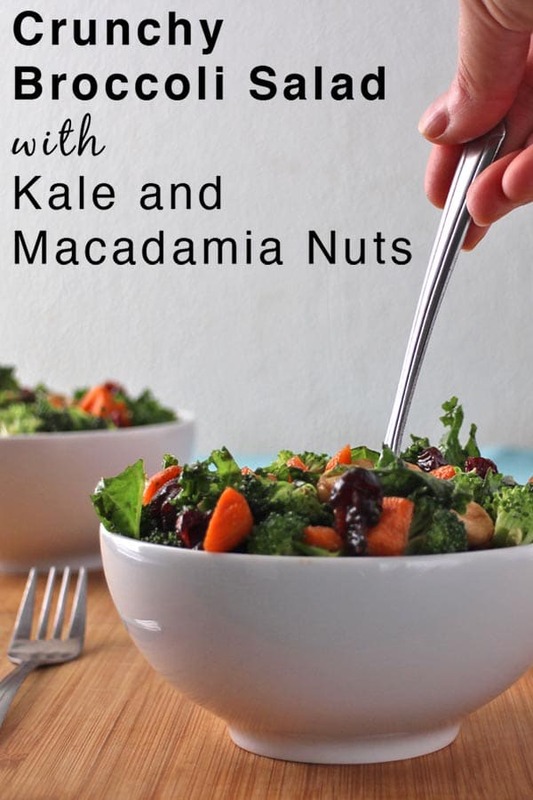 The macadamias, kale, and broccoli all bring plenty of protein to the table already, so this is a super satisfying salad, even on its own. Crunchy broccoli salad is a perfect summer side dish, especially when it’s loaded with massaged kale and macadamia nuts in a sweet balsamic dressing! 4 cups chopped kale – stems removed. Think bite-sized pieces. In a large bowl, combine the kale, vinegar, olive oil, and salt. With clean hands, masssage the kale until it turns bright green. Add the broccoli florets, tossing well to coat in the dressing. Add the remaining ingredients, tossing well. Serve now, or chill up to overnight. 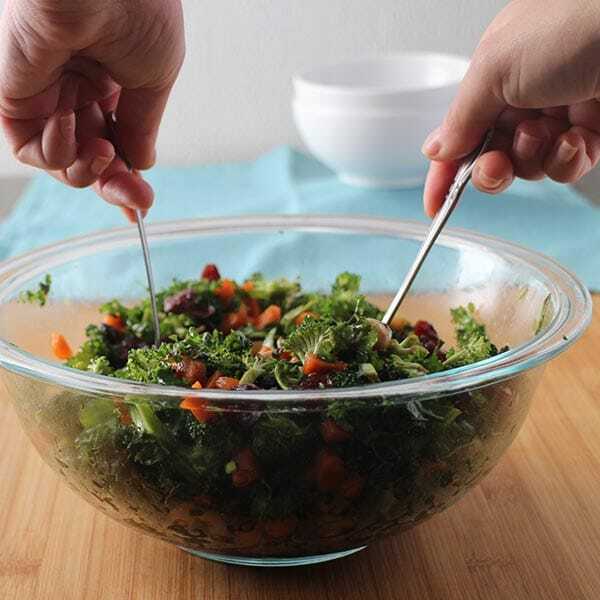 Be sure to give the broccoli salad a good toss just before serving, because the goods do tend to work their way to the bottom as the salad sits.